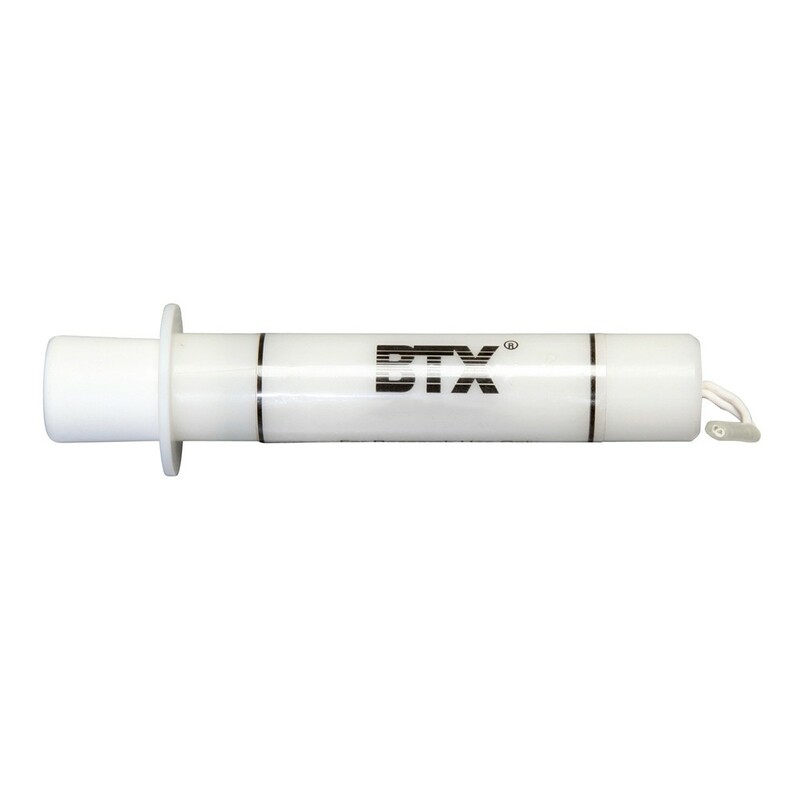 The BTX 2-Needle Array Electrode is an in vivo style electrode specifically designed for intra-musclular or intra-dermal gene delivery. 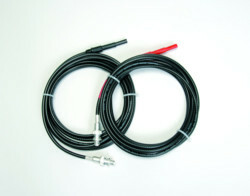 It is available with 5 mm and 10 mm electrode gaps (distance between electrodes). The 45-0167 handle is designed for the 45-0120 10 mm needle tips and used for larger muscle masses, such as rat gastrocnemius. The 45-0168 handle is designed for the 45-0121 5 mm needle tips and is recommended for smaller muscle masses, such as mouse tibialis. 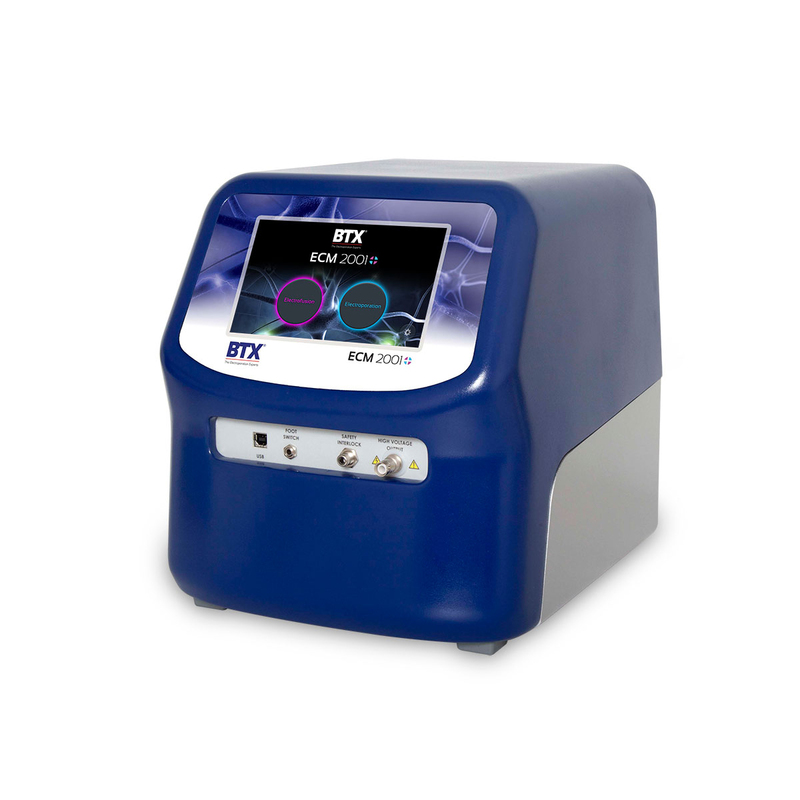 Other species and tissues may be electroporated with the 2-Needle Array. 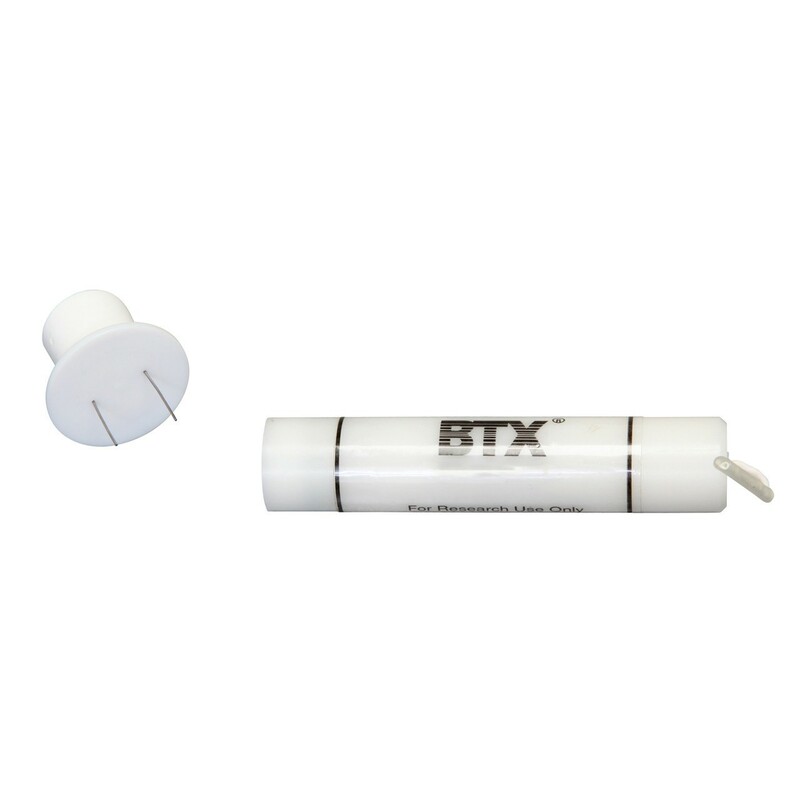 The needles themselves are made of medical grade stainless steel. 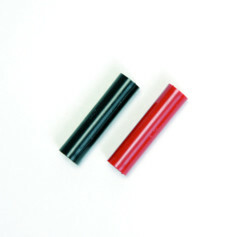 The kit consists of a reusable Delrin 2-needle array handle and disposable two-needle array assemblies. The needle array assemblies are conveniently packaged in “six packs.” The needles themselves are made of medical grade stainless steel. Among the non-viral techniques for gene transfer in vivo, the direct injection of plasmid DNA into muscle is simple, inexpensive, and safe. In vivo gene delivery by injection and electroporation of DNA into muscle tissue has been shown to enhanced gene expression by 100-fold compared to injection alone. DNA vaccination by direct in vivo administration of plasmid-based DNA vectors has proven to be very effective in animal models. 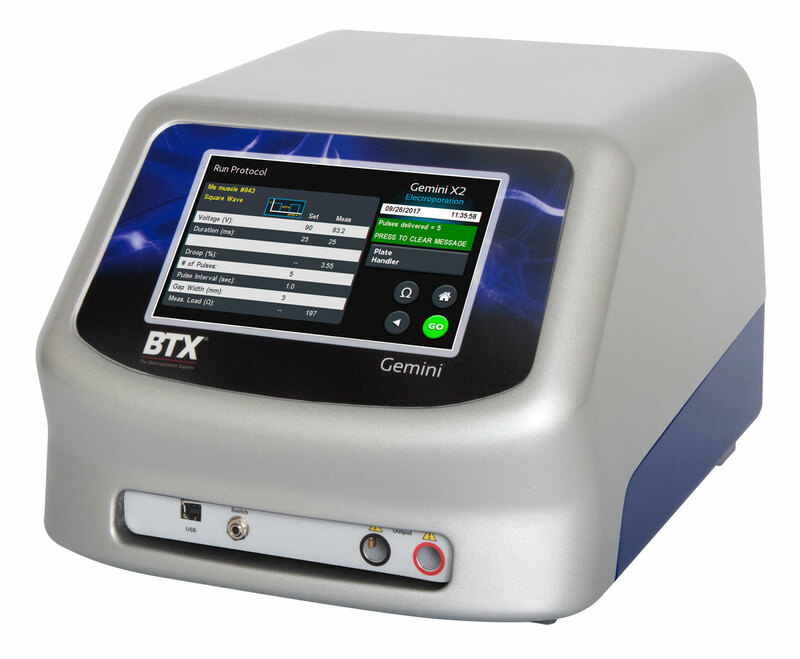 It has been demonstrated in the literature that non-viral electroporation enhances gene expression in muscle greatly, making it possible to induce immune response in large animals. Grasping the Needle Array handle, simply position the handle over a needle array assembly and push to secure the needle array onto the handle. 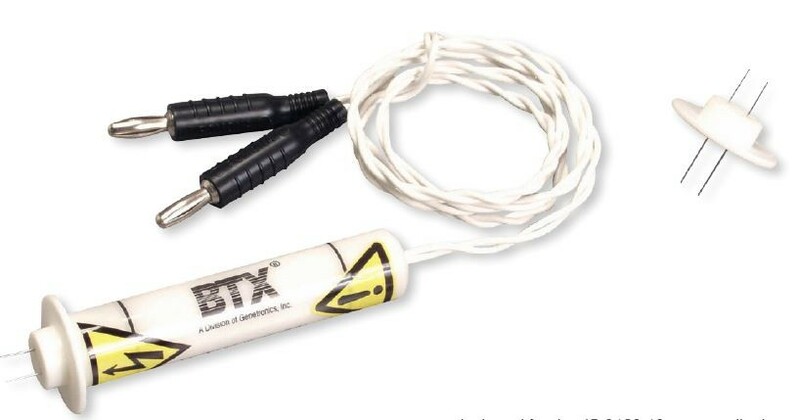 Attach the handle to a BTX pulse generator via the high voltage banana cables. Remove the needle safety shield, place into the tissue, and deliver the pulse. Discard the needle array and prepare for the next experiment. 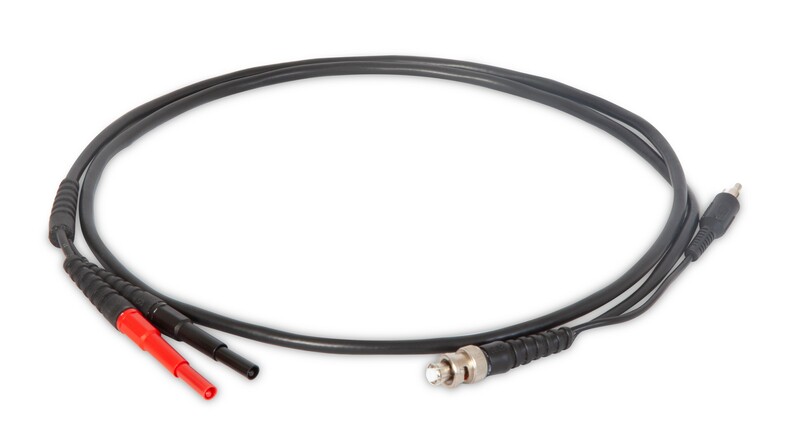 In this example, the Gemini X2 generator is connected using the sequence of cables and adapters illustrated below, then connected to the 2-Needle Array Electrode. 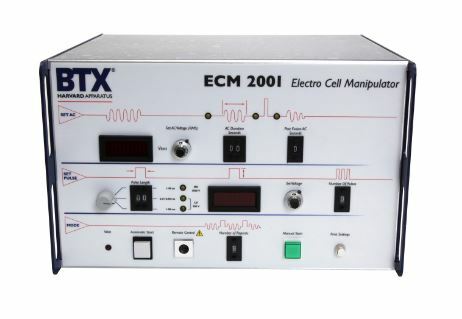 In this example, the ECM 2001+ generator is connected using the sequence of cables and adapters illustrated below, then connected to the 2-Needle Array Electrode. 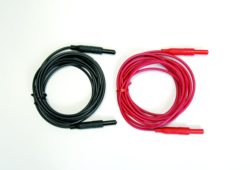 In this example, the Legacy ECM 2001 generator is connected using the sequence of cables and adapters illustrated below, then connected to the 2-Needle Array Electrode. 1. Onodera. S, Arthritis and Rheumatism, 56 (2): 521-530 (2007). 2. Nakano et al., Human Gene Therapy, 12: 1289-1297 (2001). 3. Widera et al., The Journal of Immunology, 164: 4635-4640 (2000). 4. Mir et al., PNAS, 96: 4262-4267 (1999). 5. Aihara and Miyazaki, Nature Biotechnology, 16: 867-870 (1998).